There comes a time in life when the cheap, watery beer ubiquitous at youthful keg parties and in not-quite-legally-sourced 24-packs just isn’t good enough anymore, when Natty Ice and Keystone Light are upgraded to... absolutely anything but Natty Ice and Keystone Light. 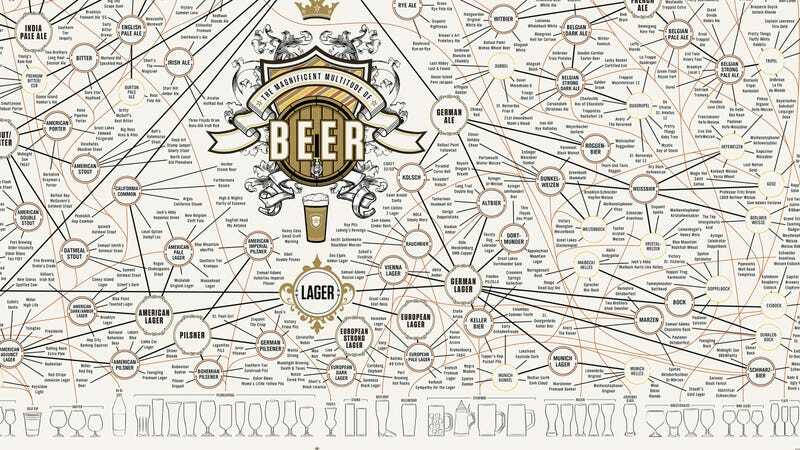 For those who have developed a more refined taste for beer, the can’t-stop-won’t-stop data viz lovers at Pop Chart Lab have just unveiled a new project mapping out The Magnificent Multitude of Beer. Everything from Japanese rice lager to vegetable ale to a veritable bounty of bocks are represented, along with a guide along the bottom of the best vessel for consumption (like can, Solo cup, flute, or boot). The whole thing measures a massive 60- by 40-inches; that’s a full five feet wide, which makes it almost more of a wallpaper than a poster. Ironically, in spite of the incredible variation and sophistication it celebrates in this beverage of choice, the reality of a print that size seems better suited to a university dorm room than an adult’s apartment (or maybe that’s just me; also, this would take up most of my studio...).